When you consider the price and that this is quite a specialist item, its shortcomings are easily forgiven. Back in the '90s, heavyweight acts such as Morbid Angel, Korn and Meshuggah jumped in at the deep end with Ibanez Universe seven-string guitars, shaking the Earth with an additional low B string. The concept evolved into the '00s, with Meshuggah switching to custom-built eight-string axes, and Ibanez offering off-the-shelf models in 2007. "It's hard to resist knocking out an avalanche of mid-point riffage." Schecter also got in on the act with its Damien Elite-8 (£599), Hellraiser C-8 (£899) and Blackjack ATX C-8 (£899). 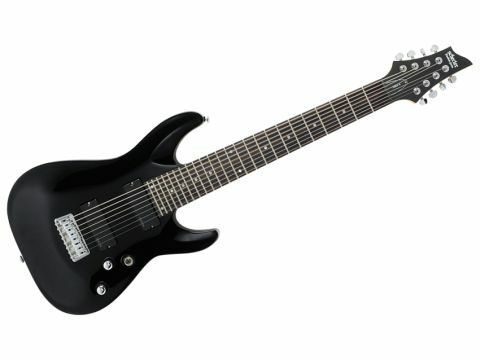 Following these is the Omen-8, Schecter's most affordable eight-string yet. The sleek black finish of the contoured basswood body gives it a serious air and the maple neck and 24-fret rosewood fretboard are highly playable, with nicely finished jumbo frets. If you're aiming high, then you'll find that the chunky heel joint compromises access to the top few frets, but they'll suffice for tapping or a climactic bend. With a scale length of 26½ inches - an inch longer than a Stratocaster - you'll find the guitar has increased string tension and therefore should increase the tuning stability of the strings. The Omen-8 comes with a .010 string on the top, going down to a meaty .069, and it's intended to be tuned from low to high to: F#, B, E, A, D, G, B, E. Using a low F# instead of a G facilitates playing typical powerchord shapes. The 15:1 ratio'd tuners are OK, but the finer tuning of a higher gear ratio would help on the lower strings. Played acoustically, the Omen-8 exhibits a strong, defined tone with plenty of sustain. The longer neck isn't really noticeable, and it's not as thick as you might fear. In fact, it's a pleasure to play. The wide fingerboard could be a stumbling block, though. Bear in mind that the higher strings feel a little on the stiff side, so you might want to try lighter ones, and the eighth string could be a tad heavier to give it the solidity of the seventh. When it comes to electronics, the massive passive humbuckers sound heavy, but the bridge pickup is slightly harsh and lacks the sophistication of an aftermarket pickup. The neck position isn't particularly gratifying, either - where's that creamy mid-range 'wood'? They're not terrible by any means, but both are susceptible to noise/interference, so a set of EMGs or Seymour Duncans would surely make a terrific upgrade. With the distortion cranked, the naturally chunky tone comes through despite the less-refined pickups. It's hard to resist knocking out an avalanche of crushing mid-point riffage, always with the option to rev up that bulldozing low string or go racing up the fretboard to take the lead. You may notice occasional high-pitched resonances (from the strings vibrating behind the nut) but that's quickly fixed with foam or tape. Compared to Schecter's pricier eight-strings, it's understandable that compromises have been made to bring this one in on budget. The Omen-8 has clout where it counts, though, with great playability and a solid build.